AMHERST – Bicycles are so common we forget they weren’t always here and that the history of two-wheeled, human-powered transportation is long and complicated. 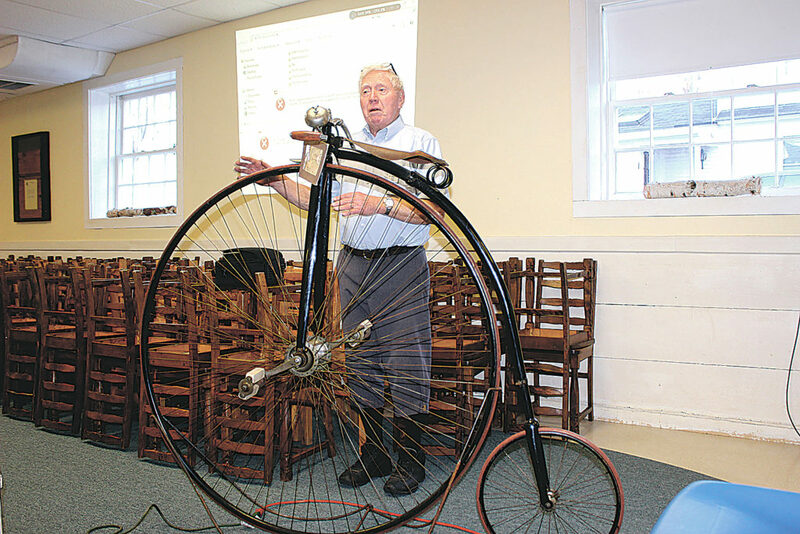 Zip Zamarchi, from Eliot, Maine, was in Amherst recently to talk about bicycles and display some of his collection of antique bikes that he parked inside and outside the Amherst Congregational Church for the Historical Society’s April 9 program. It was an informal, interactive presentation, with Zamarchi answering questions and offering bits and pieces of technical information and bicycle lore. A two-wheeled pedal-less contraption was first invented by a German baron in the early 19th century, but real bicycles weren’t invented and mass produced until the 1880s. By 1890, the introduction of pneumatic tires and other comfort and safety improvements, bicycles helped usher in a golden age of bicycles. By that time, 3,000 manufacturers made bikes, including the Wright Brothers. Zamarchi brought about a dozen of his 60 or 70 antiques, including a bike without pedals, requiring the rider to push with his feet, a bike called a Boneshaker, another one made of wood and one with a rope seat he called his favorite. To a rapt audience, including members of the Wheelmen, an antique bicycle club, he talked about the difference between the United States and Europe, where bike use became ingrained early partly because there were ready-made paths along rivers created by cattle that pulled barges before the advent of the steamboat. In New York’s Central Park, he said, the introduction of the bicycle caused conflicts between bike riders, horseback riders and walkers all vying for the same pathways. In New England only mill owners were rich enough to buy bicycles at first and only the children of the rich had bikes. Zip described three bicycle trips in Germany and Holland and to Switzerland along the Rhine River that he and his wife, Carol took. Carol Zamarchi was in the audience, and she added another point of view. 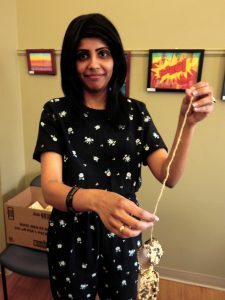 When she and Zip first began riding their antique bikes in parades long ago,“women had to ride in the back of the parade,” she said. And that was long after a Latvian immigrant from Boston named Annie Londonderry became the first woman to ride around the world on a bike, in 1894. Through most of his presentation Zamarchi stood next to the modern bicycle’s forerunner, called a penny-farthing with a giant front wheel. In the late 1800s it was the most comfortable and easiest bike to use, and high school graduates would often get them as gifts. But it had its drawbacks. “If you go over it, you land on your head,” he said.